The third test of the missile, its first canister launch, on January 31, 2015 was successful. The missile was launched from a road mobile launcher after its canister was erected to a vertical position. On launch, gas generators in the canister pushed up and out the 17-m long missile weighing over 50-ton. As the missile cleared the canister, at a height of about 20-m its first stage ignited and the missile climbed and accelerated along its pre-programmed ballistic trajectory towards its target. After the firs stage burnt out, the missile continued to climb and accelerate using its all composite second stage, and later, its all composite, shaped third stage. At the end of its powered flight, the missile continued to climb into space bleeding speed. It reached an altitude of more than 600 km before arching back towards Earth under gravitational pull. As it lost altitude, it accelerated and rapidly gained speed. On re-entering the Earth's atmosphere, air friction raised Reentry Vehicle (RV) surface temperature to beyond 4000 degree Celsius. 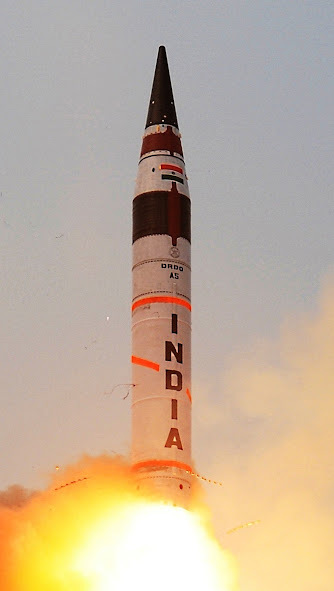 Protected by its indigenously designed and developed carbon-carbon composite heat shield, the missile's dummy warhead remained cool at less than 50 degree Celsius. Guided by the on-board computer, ring laser gyro based inertial navigation system, state-of-the-art micro inertial navigation system (MINS) and fully digital control system the missile hit the designated target point accurately, meeting all mission objectives. Announcing the success of the test launch, Dr VG Sekaran, Mission Director, Prog. Dir. 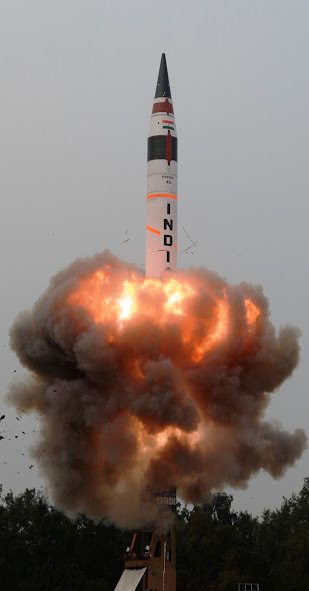 Agni and DG Missiles and Strategic Systems said, "All mission objectives have been achieved, down range ships have confirmed final splashdown, the mission is a great success and it is a momentous occasion." Ships located in midrange and at the target point tracked the Vehicle and witnessed the final event. All the radars and electro-optical systems along the path monitored all the parameters of the Missile and displayed in real time. The DRDO had earlier successfully carried out a “Missile Ejection Test” (MET) using a dummy missile weighing 50 tons. The MET validated critical newly developed technologies such as launcher-canister interface and effective sealing between the missile and gas generator. The missile exited at the correct velocity and the inter-locking instruments, electronics and sensors worked perfectly. As the missile cleared the canister, the sensors accurately signaled first stage ignition to the missile computer.